The rich man in his castle, The poor man at his gate, God made them high and lowly And ordered their estate. In his book on hymns, Albert Bailey writes of this particular one, “For once Mrs. Alexander has forgotten her theology and lost herself in the beauty of nature” (The Gospel in Hymns, 354). Many of us, if not all, have had these moments. Whether we’re in a park, on a mountain, at the sea or a lake, or simply driving down the highway with a glorious sunset behind us, it is not difficult to find ourselves lost in the beauty of God’s creation. These scenes should bring to mind Genesis 1:31: “And God saw all that he had made, and it was very good.” Albert Bailey is perhaps mistaken when he claims that Alexander forgot her theology in the writing of these verses. For when we are in the midst of God’s creation, are our ideas of who God is not being shaped by all that we see? God made a good creation, and He loves it. Our God is a good God, who gives us good things, and then tasks us with taking care of them. Our God is imaginative, and His creation is both whimsical and sometimes startlingly majestic. Let us lift our voices in praise to our maker, the creator of all things bright and beautiful. This text was written by Cecil F. Alexander as part of her collection of hymn texts on articles of the Apostle’s Creed. This specific hymn is Alexander’s explanation of the phrase, “Maker of heaven and earth.” The text is also based on Genesis 1:31: “And God saw all that he had made, and it was very good.” Her text was first published in 1848 in seven stanzas. The first stanza has since been turned into a refrain, and stanzas three and six are often omitted. The tune ROYAL OAK is presumably named for a tree at Boscobel, Shropshire, England, in which King Charles II hid during the Battle of Worcester in 1651. In the seventeenth century, the tune was associated with the loyalist song, “The Twenty-Ninth of May,” celebrating the restoration of the monarchy under Charles II. In the nineteenth century, Martin F. Shaw arranged the tune as a hymn setting, and it is now commonly associated with Alexander’s text. Use light instrumentation, such as piano, flute, recorder, or guitar. 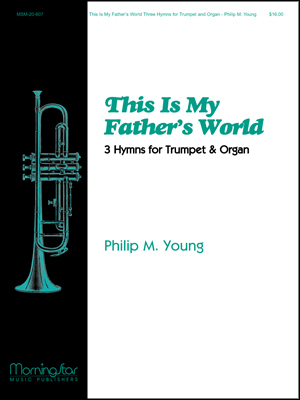 John Rutter’s 1990 arrangement of the hymn is beautiful for choir, with a melody and accompaniment that fits the text wonderfully. It also is not terribly difficult, and can be accompanied with a variety of instruments, or simply piano. There are a number of difference services in which this hymn would be appropriate. It could be sung during a celebration of God’s creation, as a hymn of response to a reading of the Apostle’s Creed or the first chapter of Genesis, or as an opening hymn of praise throughout the year. 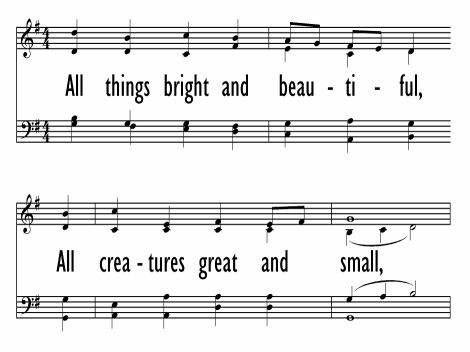 Along with a reading of the Apostle’s Creed, this hymn could be paired with the hymn “All Creatures of Our God and King,” or “For the Beauty of the Earth.” This is also a great hymn to teach children, due to the repeated refrain and simple melody. Display Title: All things bright and beautiful First Line: Each little flow'r that opens Tune Title: ROYAL OAK Author: Cecil F. Alexander Date: 1992 Source: Hymns for Little Children, 1848, alt. 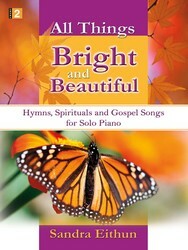 Display Title: All Things Bright and Beautiful First Line: Each little flower that opens Tune Title: ROYAL OAK Author: Cecil F. Alexander Meter: 76.76 refrain Source: Hymns for Little Children, 1848.